Smoked, char-grilled, griddled…there really isn’t one right way to make a burger. But by using fresh, locally sourced ingredients, crafting the patties by hand, and serving with a little extra love, these eight burger bars draw local regulars and visitors from all over the world for a bite of some truly special ground beef menu items. We asked our Virginia is for Lovers Facebook and blog fans to nominate their preferred burger bars that utilize locally sourced products and create mouthwatering results. Read what makes these local restaurants fan favorites. Jack Brown’s has become synonymous with irresistible burgers, using hand-ground, farm-to-table Wagyu beef in their high-quality patties. While there are now locations all over Virginia and even in other states, the original Jack Brown’s calls Harrisonburg home, and has been serving locals and college students at nearby James Madison University since 2008. If we could choose one word that describes the Timberwood Grill philosophy, it would be family. What does that mean? It’s simple: the moment you walk in the front door, you become more than a customer. You join the Timberwood family, and their goal is to treat you as such from that point forward. Every day, they patty burgers by hand and cut lettuce for salads instead of using frozen patties and pre-mixed industrial sized bags of salad mix. All this is what you do at home for your families, so why would it make any sense to do it differently at Timberwood? And that sauce, side, or soup you love? Just ask, and they’ll give you the recipe so you can share it with your family and friends. With locations in Tappahannock and Kilmarnock, NN Burger is a new Virginia-born Gourmet Burger and Craft Beer restaurant specializing in fresh locally-sourced ingredients. Each hand-crafted, artisan Burgers is prepared in a unique two-step process. First, each Burger is placed on a 700 degree wood-burning grill to infuse a delicious smoky flavor – then a seasoning blend made from traditional Virginia herbs is applied. Next, each Burger is transferred to a second super-hot flat top grill to quickly seal in the juices and finish the cooking process. NN BURGER® has been voted “Best Burger” in the annual Virginia Living Magazine Reader’s Poll. Pure Eats features fresh, homemade doughnuts every morning, locally sourced, all-natural burgers (Buffalo Creek Beef obtained from Lexington), chicken (Shenandoah Valley Organic in Harrisonburg), and veggie burgers (NoBull located in Charlottesville), plus Homestead Creamery milk shakes and a variety of Virginia craft beers. This outstanding restaurant brings local food to the table at a reasonable price. At Citizen Burger Bar, they believe that kicking back with a tasty burger and a beer is one of life’s essential liberties. To secure that sacred right for the people of Charlottesville, Clarendon, and Richmond, Citizen Burger Bar teams up with a few exceptional nearby farms to design a menu around locally produced, top-tier ingredients. It’s a simple plan. No muss, no fuss, and definitely no hormones – just uncommonly good stuff to eat and drink, much of it hailing from their own little patch of earth. Brauburgers serves 100 percent freshly ground and hand-made Angus beef patties sourced from family farms. The food is made fresh every day using meats that are never frozen and are Certified Humane with the highest satisfaction in mind. Delight yourself with Specialty Brats, fresh toppings, and homemade sauces that are prepared daily. This burger bar keeps 22 craft beers on deck from around the region with a special emphasis on local craft microbreweries. Pull up a bar stool and enjoy one of their handcrafted burgers made with a whole lot of Virginia pride. The quality, passion and creativity set Melt apart from the rest of the burger crowd. They use only high-quality products, including 100 percent natural Angus beef in a proprietary blend (made just for the restaurant by a local purveyor), domestic lamb, and turkey ground daily. The fresh seafood and local produce is delivered every day. They make their buns in-house, every day so the bread is always fresh. This is a place you look forward to coming to for a fabulous lunch, after a long day at the office, or for a great family night out. The focus at 80/20 is on a more natural, healthy and environmentally friendly approach to dining. Their objective is to support the area’s local farmers and their products to provide a healthy, unique, and cost-conscious experience. The burger bar boasts over 100 beers supporting every local brewery that they can get their hands on. They provide Virginia raised, grass fed and finished beef, house-made baked goods, and local farm fresh produce when available. All of their beef is sourced from Leaping Waters Farm in Shenandoah, VA and is certified grass-fed and grass-finished. You will see and taste the difference at 80/20 Burger Bar! We always like to hear about your preferences. 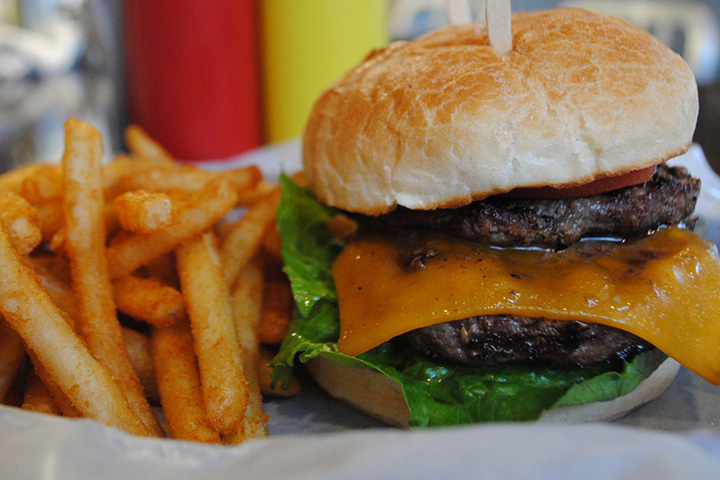 What burger bar stands out to you as one of the Best of Virginia? Leave a comment to let us know your picks. Corner burger on Timberlake in Bedford/Forest – fantastic – better than Brau Burgers.